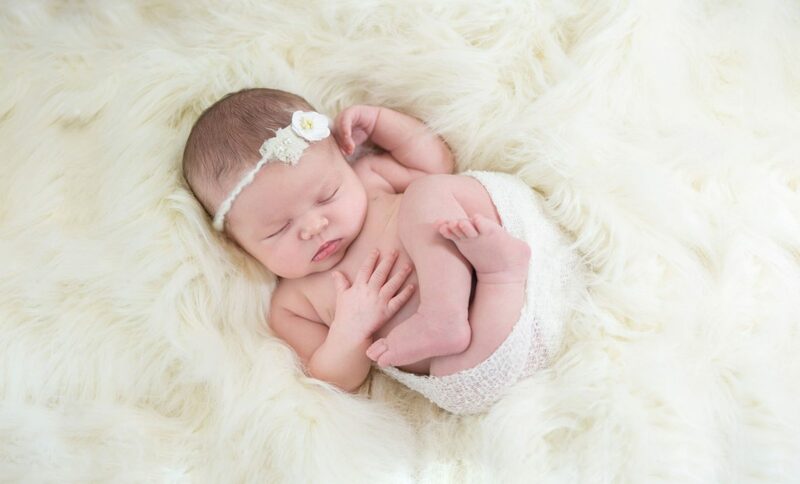 Newborn photographs are special for many reasons, especially the serene baby poses so many parents love. However, many new parents and parents-to-be are surprised to learn those newborn poses affect when they should book their baby’s newborn photography session. The fact is, newborn poses are easiest to achieve — and safest –during your baby’s first 15 days. In fact, after many years of photographing newborn babies, I’ve found that 5 to 10 days of age is the real sweet spot. Of course, not all babies are the same. There will always be exceptions. However, when it’s convenient for the new parents, I suggest they schedule their newborn photography session between the ages of 5 to 10 days. After 15 days of age, a newborn baby likely to be less comfortable in curly newborn poses. In addition, their sleep patterns change, making particular poses much more difficult (sometimes impossible) to achieve. Certainly, a newborn photography studio can create beautiful portraits of babies older than 14 days. But an older baby will typically allow fewer newborn posing options. That’s not to say if your baby has past their 15th day that you have no photography options. If your baby is older than two weeks, talk with your photographer about conventional family and baby pictures. Or perhaps a family lifestyle session. When should you book with your newborn photography studio? Because the ideal timeframe for newborn photos is short, you should contact your newborn photographer as early as possible to confirm their availability within 15 days of your due date. I recommend that clients contact us during their second trimester to schedule their newborn photography session. At that time, we set a tentative photography date within 1 to 15 days after their baby’s expected date. Later, we make adjustments to the date and time if needed, depending on when the baby actually arrives. By contacting your photographer early, you increase your chances of them being available when your baby arrives. Similarly, it will leave you time to find an alternative if your preferred photographer is not available. Also, it’s one less thing on your “getting ready for baby to-do list”, which will only get busier as your due date approaches. If you reading this and you’re already nearer to your due date (or even if you’ve just had your baby), you still might be in luck. I regularly get calls from new parents who have just had a baby and who want to schedule a newborn photo shoot. Sadly, it’s not possible to accept every last minute request, but we do our very best to make time for everyone. But don’t wait any longer. Contact your photographer as quickly as possible to see if you can get on their schedule within your baby’s first two weeks. When you book your newborn photography session, your photographer will likely send you a contract and request a deposit to confirm. Typically the contract will note a tentative date for your newborn session, which will be confirmed later, depending on your baby’s arrival. Within the first couple of days after your baby is born, you should contact your photographer to confirm a date and time for your baby’s portrait session. Here you can read more about planning for a successful newborn photography session. What other questions do you have to help you plan your newborn photography session? Leave a comment below.